The number of Millennials, or those born between 1980 and 2000, is on the rise in every industry in the Middle East. If your company isn’t actively recruiting and developing these young talents, then it will soon begin to do so as recent studies have estimated that Millennials will comprise half of the global workforce as early as 2015. By 2025, Millennials will make up 75 percent1 of all workers. But as the number of Millennials entering the workforce is increasing, so is unemployment. In fact, unemployment in the Middle East and North Africa (MENA) region –a predominantly young place– has become the highest in the world, and it is largely a youth phenomenon. The share of youth (ages 15 to 24) in total unemployment at least doubles the total rate. Moreover, at about 25%2, the youth unemployment rate in the MENA exceeds that of any other region in the world. Millennials who are about to enter the MENA workforce will fundamentally change how business is conducted in the future. HR practices and policies designed to attract, develop and retain this vast cohort must change in order to reflect this generation’s work (and life) expectations. By all accounts, Millennials are unlike preceding generations. They view the world differently and have redefined the meaning of success, personally and professionally. In fact, the February 2014 Bayt.com Millennials in the MENA survey, shows that the top three priorities for Millennials in the MENA are: financial stability and independence (78%), good health (76%), and a successful career (76%). They find the rising cost of living (59%), the lack of financial stability (57%) and the lack of work-life balance (47%) to be the main causes of stress in their daily life. A misinterpretation of the priorities of Millennials in the MENA has led to a misunderstanding among the different generations co-existing in today’s workplace. For example, only 29% of those aged 35 and above feel that they can learn a lot from their younger colleagues, compared to 58% of Millennials who feel they have much to learn from their older colleagues. On the other hand, a whopping 75% of Millennials believe older colleagues do not take full advantage of technology available, compared to 61% of older professionals who think the same about Millennials at their workplace. However, today, business leaders are increasingly realizing the Millennial generation’s unique abilities and perspective, and employers are looking for ways to harness their strengths. Despite the challenges Millennials experience in today’s job market, the bad times will not hamper this generation’s optimism. Among the young adults surveyed in the Bayt.com Millennials in the MENA survey, 91% said they are comfortable working with older generations, while 78% would be willing to sacrifice their personal life in order to further their career. 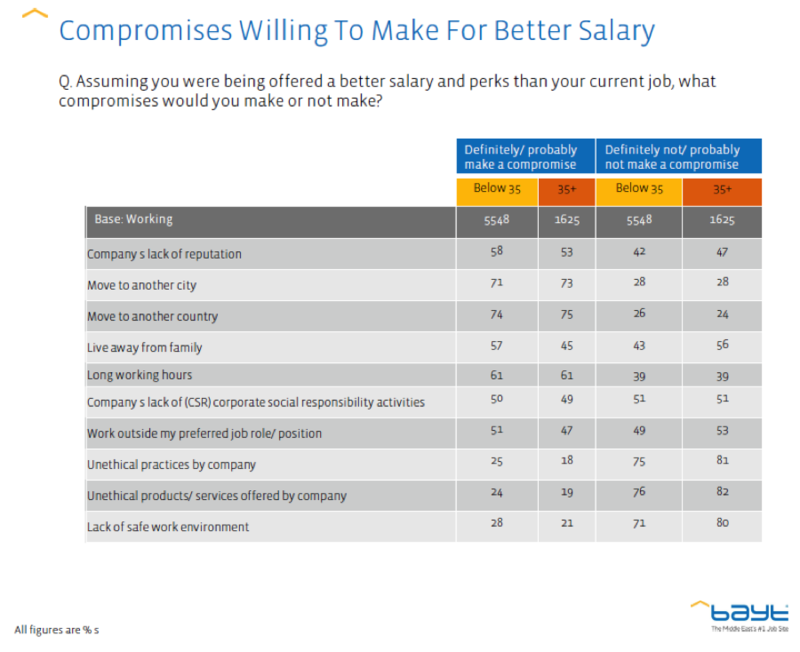 When asked what compromises they would make for a better salary and perks, 74% would move to another country, 61% would work longer hours, and 57% would live away from their family. However, young adults are concerned about their future career prospects. A third (32%) of Millennials responding to the Bayt.com Millennials in the MENA survey said there was a disconnect between their education and current job profile, while 28% confirmed a lack of relevant training, a number that could reflect Millennials’ awareness of the fast-paced change inherent in a knowledge economy. 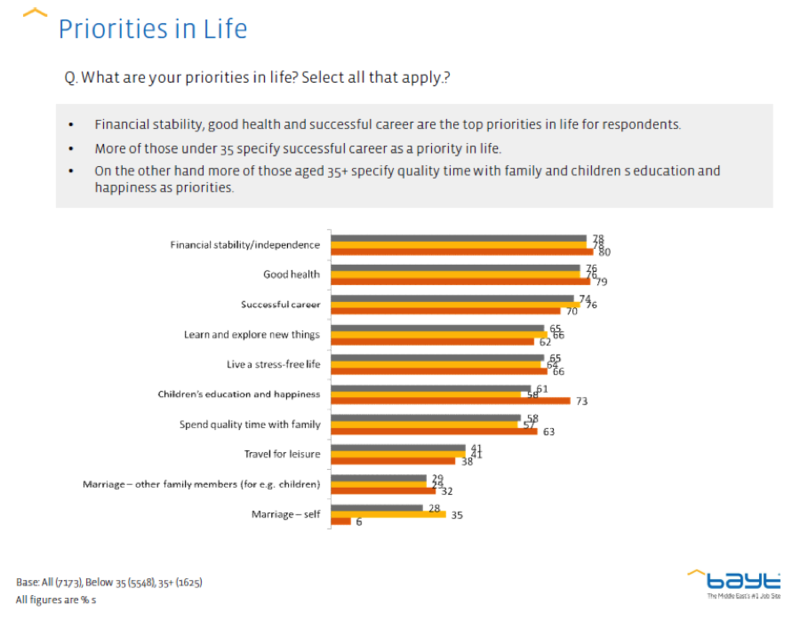 In addition, the survey reflected an increased level of vulnerability among young adults; 42% suffer from a lack of financial support, 28% feel they do not have the experience required to succeed professionally, while the majority (62%) still rely on income from their family as supplementary income. When asked about what would make them change sectors, the majority (52%) would leave their sector for more opportunities to learn on the job, 46% chose more opportunities for career growth, while 42% would move jobs for a better salary. Millennials, then, feel vulnerable about their immediate employability and are deeply concerned whether they have the training and skills needed to compete in the long-run. They also want better prospects for professional development and a higher salary. When trying to attract Millennials to your organization, make sure to communicate what the organization does to engage workers. Let them know about the organization’s culture, open communication policy, flexible work schedules, training and development opportunities, etc. Companies are increasingly using technology to deliver this information through video streaming on recruiting websites. Employees are often featured in the videos, letting prospective employees walk with them through their day as they explain how the organizational culture fits with their job. Technology and e-learning opportunities can also be used in onboarding and cross-training programs. 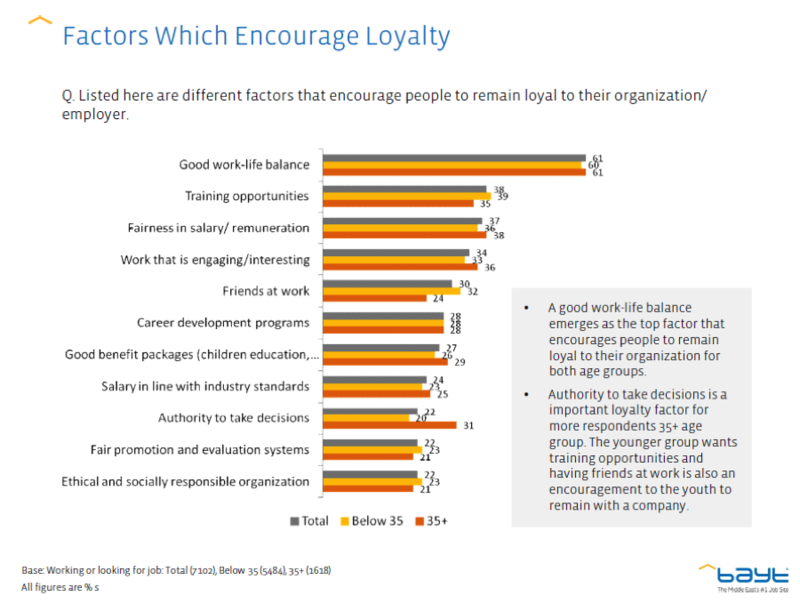 According to the Bayt.com Millennials in the MENA survey, a good work-life balance emerges as an important factor for encouraging loyalty within an organization. Having friends at work is also seen as an important loyalty factor to Millennials in the region. It may also be time to consider millennials’ compensation needs. 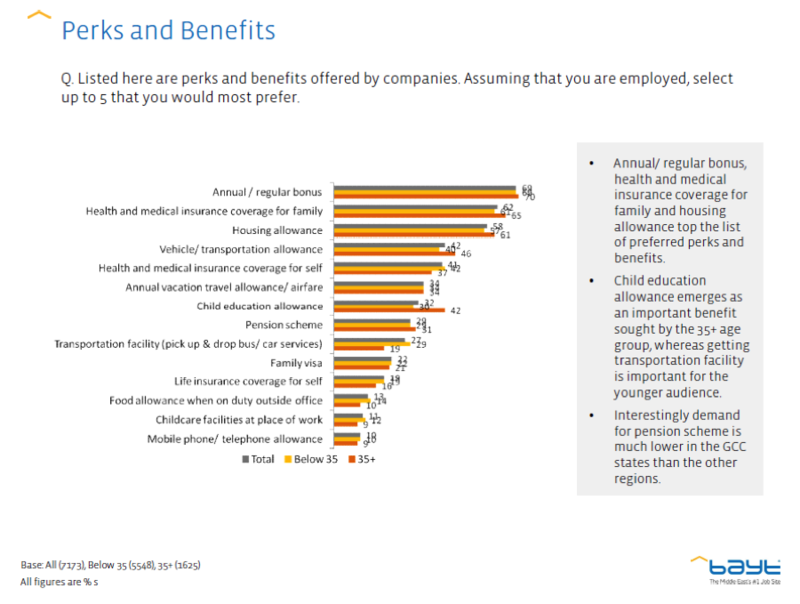 In terms of perks and benefits, Millennials in the Middle East are mostly looking for annual/regular bonus (69%), health and medical insurance coverage for family (61%), housing allowance (57%), and health and medical insurance coverage for self (42%). Compensation packages slightly above industry averages can provide your organization with a recruitment edge in attracting the best and brightest of the millennial generation. In addition to the steps taken to attract Millennials, here are some tips on how to develop Millennials into leadership roles: develop initiatives that foster mutual support and understanding among the generations. Training on intergenerational dynamics will help build rapport and a stronger sense of community. For Millennials, offer soft-skills training like how to assimilate into a new workplace culture, how to work with team members assertively and diplomatically, how to process feedback, how to approach a supervisor for coaching and mentoring, and how to set long-term career goals. Other measures include fostering an appreciation of diversity within the organization. This will help all generations avoid the stereotyping that gets in the way of valuing the skills sets of each employee. These kinds of leadership development opportunities will not only help minimize the misperceptions that arise among generations, but will also help prepare the Millennial generation to assume leadership roles when older generations begin to leave the workplace. Open and honest communication is highly valued by Millennials and they expect it from their leaders, so when focusing on creating a comfortable culture, consider not just the formal surroundings but also the nature and tone of organizational communication. Creating an organizational culture that is flexible and relaxed, has open communication, encourages sharing and innovation and offers flexibility is a good step to keeping millennials engaged. Millennials want fun and a less formal atmosphere may help foster it. As we saw previously, Millennials place a high value on having training and development opportunities available through their employers and want to acquire new skills and abilities to remain competitive, so it is now more important than ever to reinstate your training budgets. Training and development opportunities can include on-the-job training, coaching and mentoring. Some organizations have taken coaching and mentoring a step further by instituting reverse mentoring programs, which allow Millennials to share their technological knowledge with other generations in the workplace.